I think you're spot on LT with the top 6 and shows why you should never, ever write off Tigers! How on Earth they won yesterday is beyond me, but full credit for a fantastic 2nd half. Its odds on to be a Chiefs v Sarries final and I can't see Sarries beating Leinster this weekend, so there shouldn't be any excuses for fighting on two fronts. I do feel there is going to be quite a big gap between 6th and 7th. I'm fairly confident Glaws will finish 6th, but I don't see Sale winning any more games, despite their good form and Bath will probably only beat the Academy side. The teams in 2nd through to 6th all have their next game away from home. Could make for anreal shuffling of positions. Would be brilliant for Newcastle to make the play offs this season for a change. As for Quin's. Well the end of the season can not come soon enough! Don't really know what's gone wrong with us, but we need a change of coaches if we're to get anything out of this side. Can Sale pull off what woudl be only a minor upset. Possibly, but Wasps need the win too. MotM performance from George Ford won "The Clash" for Bath last year. Hopefully he can repeat that this year in Leicester's stripes. Three meetings, three thrashings so far this season. Hard to see the pattern changing. Since London Irish won the reverse fixture in Week 1 their season has been in freefall. Quins produce one good performance a month. Worcester have the ability to beat their high(ish) flying visitors. Falcons need it more though. 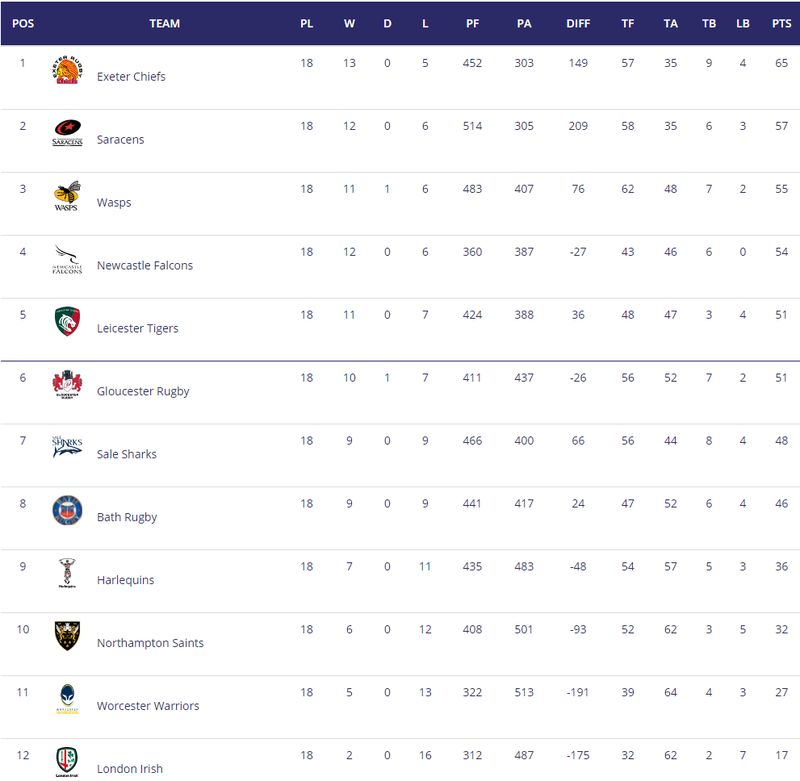 Gloucester need the win to stay in the hunt, but Exeter should be too strong. Thanks for this LT - can’t disagree with what you’ve said there. Wuss will be glad to get any points from their match against this strong Falcons team - in past seasons it would have been targeted for 4 points. We've been poor recently though (despite just managing the wins) so its not a guaranteed win for the falcons by any means. Unless Worcester up their game significantly, GF, I can’t see anything other than a win for you. Impressive turnaround for Falcons this year which gives me a bit of hope going forward! Looks like Wuss will be missing Hougaard and Mills which is a big blow too. Agree it should be a win for Quins. Not that it matters much now, I'd rate us only slightly better then Irish at the moment. Who knows we could still manage to lose this game anyway. stub wrote: Looks like Wuss will be missing Hougaard and Mills which is a big blow too. RIP - Aviva Prem (Jeff), AP. stub wrote: Unless Worcester up their game significantly, GF, I can’t see anything other than a win for you. Impressive turnaround for Falcons this year which gives me a bit of hope going forward! He had a 5 year plan, but I don't think he realised how bad a shape this club was in. We've just signed up Gary Grahams young brother who is supposed to be a real prospect in the same physical aggressive mode. So he's always looking to the future as well. However...we'll still a work in progress...and the last two performances have been pretty poor. So it'll be interesting to see how we go. 15.Mike Haley; 14.Denny Solomona, 13.Sam James, 12.James O'Connor, 11.Marland Yarde; 10.AJ MacGinty, 9.Faf De Klerk; 1.Ross Harrison, 2.Rob Webber, 3.WillGriff John, 4.Bryn Evans, 5.Andrei Ostrikov, 6.Jono Ross (capt. ), 7.Ben Curry, 8.Josh Strauss. Replacements: 16.Marc Jones, 17.James Flynn, 18.Alexandru Tarus, 19.Josh Beaumont, 20.Tom Curry, 21.Will Cliff, 22.Luke James, 23.Byron McGuigan. Jack Willis continues to be viewed as a 6 by Dai Young, which will make the match up with Ben Curry harder to score tomorrow. I have seen a lot more of Ben than Willis so will be interesting to see if the Wasp can live up to the hype. Good to see Olowofela on the bench - though not many left I guess. Tom Wood, Heinrich Brüssow, Mikey Haywood, Courtney Lawes, Dylan Hartley, Paul Hill, Jamal Ford-Robinson and Harry Mallinder are all unavailable for selection. Loz at 13 - interesting. I see that Billy V still isn't playing for Sarries - thought he was almost starting for them last week! He must be LT, as I know Takulua is , and we don't have a SH on the bench. Joel must be cover for that. You know what its like getting injury info from Dean Richards. Better chance getting blood from a stone. Nah the next one is in the bench for Tigers. Ready to take over from Benny for club and country in a couple of years. As an aside the Tigers bench is all academy generated bar the props. Three Tigers academy products starting as well. Positive to see that, in the past we'd have loaned or signed journeymen on short term deals to cover. Hopefully this will help towards us building a better and stronger squad going forwards now young players are getting a run out. I wonder if any of Bath players will remember the run around they were given in the LV cup by the likes of Simmonds and Owlefia and are maybe not looking forward to them coming off the bench. Tait, Harris, Flood, Wilson, Welch? Who am i missing from the starters? Yes but you're good at it. We've been poor the last few years and it's been something we've needed to kick on with. There's some good development squad players around now and the academy side dominated this season so there's more on the way. Just have to start integrating them better. Was a big concern with MOC who hasn't shown much skill at that previously, he seems to be learning slowly though. The Falcons website says he played for Blaydon all his life before joining Falcons in 2017. And Robinson joined Falcons when he was like 22 not really academy. Great result for Sale. Five point win over Wasps thanks to a late Yarde score. Wasps lost Cipriani moments before with an ugly head clash that also saw Robson leave the field. Robinsons been with us longer than that...Davison yeah mostly Blaydon but they're basically our academy club anyway..
Genge v Obano playing for a spot on the England tour. Different styles but could both go? Tigers have started appalling. Tino looks asleep having missed the kick off and then let Joseph run round him. Kitch makes a great cover tackle and then a completely moronic penalty from Fitzgerald. Surely he's off this summer. Tigers scrum unsurprisingly on the front foot. Genge straight into Knight. GeordieFalcon wrote: Genge v Obano playing for a spot on the England tour. Ellis Genge has already dispatched the Bath tighthead to the sin bin. Two yellow cards inside 25 mins for Bath. Maybe should have been. Looked like Dunn stood up under pressure. Tigers defence is poor. Paying the price for not playing an openside AGAIN! I'd rest Mako and Cole this summer. Genge/LCD/Sinkler I'd prefer. Tigers should be dominating but are lacking someone who will attack the breakdown. We're playing with three 8s and we just aren't physically dominating enough to get away with that.